A Scottish nurse who contracted Ebola while working in West Africa is recovering well after the virus caused her to develop meningitis. Pauline Cafferkey, 39, was readmitted to an isolation unit at the Royal Free Hospital in London earlier this month after suffering an apparent relapse. Health officials confirmed she had been diagnosed with meningitis caused by Ebola and had a "long recovery ahead". Ms Cafferkey, from South Lanarkshire, contracted Ebola in Sierra Leone. Dr Michael Jacobs, who is treating Ms Cafferkey at the Royal Free Hospital in London, said: "Pauline has become unwell by meningitis caused by the Ebola virus. "But to be very clear about this, she hasn't been re-infected with the Ebola virus. Media captionDr Michael Jacobs: "Pauline has made significant improvement but has a long recovery ahead of her"
"This is the original Ebola virus that she had many months ago, which has been lying inside the brain, replicating at a very low level probably, and has now re-emerged to cause this clinical illness of meningitis. And this is obviously a serious thing." Dr Jacobs said Ms Cafferkey had "became critically ill due to neurological complications from the meningitis" while being treated at the specialist isolation unit at the Royal Free Hospital. He added: "I'm really pleased to tell you that in the last few days she's made a significant improvement. She is much better now. "I think she has a long recovery ahead of her and will be with us for quite a while still." 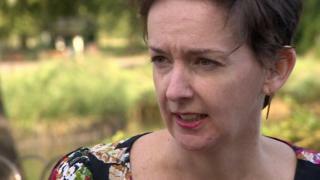 Unprecedented, extraordinary and unusual - the words used by doctors treating Pauline Cafferkey. Meningitis has been seen in Ebola patients in West Africa during this outbreak, but only at the height of their initial infection. The virus has resurged months later and has been contained to just her brain and spinal cord. Due to the lack of resources in the affected countries we simply do not know if this has happened to any of the 17,000 Ebola survivors in West Africa. The World Health Organization says meningitis should be "on the radar" for survivors, alongside eyesight problems and joint pains. While the virus was briefly detected in Ms Cafferkey's blood, the risk of anyone spreading the infection after recovery is thought to be very low. Ms Cafferkey, who is from Halfway, Cambuslang, contracted Ebola while working at a treatment centre in Sierra Leone last year. The nurse spent almost a month in isolation at the Royal Free at the beginning of the year after the virus was detected when she arrived back in the UK. She was later discharged after apparently making a full recovery and returned to work as a public health nurse at Blantyre Health Centre in South Lanarkshire. However, she became unwell earlier this month and was admitted to the Queen Elizabeth University Hospital in Glasgow for treatment. On 9 October, she was flown from Glasgow to London in a military aircraft to receive treatment in the isolation unit at the Royal Free Hospital. Last Wednesday, the hospital said Ms Cafferkey was "critically ill" after her condition had deteriorated. Following treatment her condition improved to "serious but stable" by Monday. Dr Jacobs said Ms Cafferkey has been treated with "a highly experimental" anti-viral drug in the early stages of development called GS5734. "We don't know if it's of benefit to her," he said. And he added: "The crucial treatment is the exceptional nursing care at the Royal Free Hospital, that's what has really made the difference here. "It's really important to understand we don't use the term critically ill lightly. It means someone is at imminent risk of dying. "We were extremely concerned about Pauline's condition. That's why we're thrilled to be having this conversation now." Ms Cafferkey's family have previously claimed doctors "missed a big opportunity" to spot she had fallen ill with Ebola again. A total of 65 close contacts of the nurse have been identified, with 40 of those offered vaccinations as a precaution. Health Protection Scotland said: "A number of Ebola tests have been carried out and they have all returned negative. "All appropriate infection control measures remain in place." The health agency said no new contacts of Ms Cafferkey had emerged and it continued to monitor those already identified. It added: "The statement from the Royal Free this afternoon is very welcome news. "It is clear that there is some learning still to be done with regard to Ebola, and Health Protection Scotland will work with national and international partners to play whatever part it can in that work. "The announcement from the Royal Free has not changed our assessment that the risk to the public remains extremely low." The Ebola outbreak in west Africa has killed 11,312 of the 28,457 people infected since December 2013, according to the latest WHO figures. What are the risks of Ebola recurring?